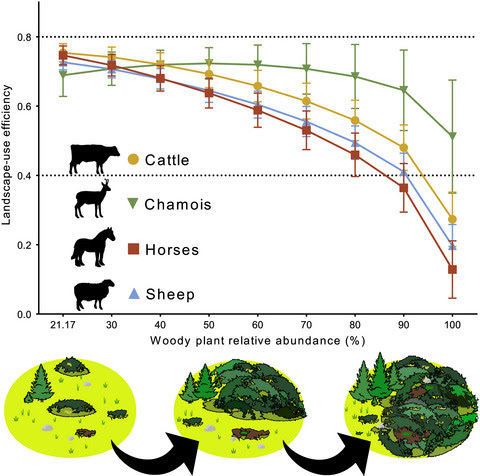 Evolution of the landscape-use efficiencies (LUE) of Pyrenean chamois and seasonal livestock along different scenarios of woody plant expansion. Slopes of the linear regression are also reported for each species. Figure: Espunyes et al, 2019. Climatic and land‐use changes are leading to shrub expansion in alpine grasslands. In this work, we address whether wild and domestic herbivores under varying conditions of resource availability will be able to use efficiently their foraging landscape. In a new study plublished in the journal Global Change Biology authors found that “shrubification” affects herbivores differently depending on their feeding preferences and plasticity. Mixed feeders will manage better in fallow landscapes but free‐ranging livestock will be less efficient, highlighting a growing economic risk for mountain livestock farmers worldwide.